Parents sometimes find it difficult to convince the kids to be more helpful when it comes to household chores but there are still effective ways in which to attract the attention of the child. You cannot expect from them to feel thrilled by the idea of spending the whole afternoon in cleaning their room, so it is better to be patient and to gradually introduce them the basic tasks. When kids hear the word “cleaning”, they usually associate it with a lot of time-consuming and boring tasks. For that reason, it is better to introduce everything as a game and to set rules which the kids need to follow. Organize a competition when time for cleaning comes and give tiny awards for those kids who finish with the tasks more quickly than the others. This way you will keep their interest and you will help them realize that cleaning could be fun. There is nothing more rewarding than knowing that your efforts are appreciated. Show your kids that you are proud of their willingness and they will definitely take part in the cleaning more often than you expect. Start with simpler tasks such as mopping of the floors and washing of the dishes and demonstrate them how to do them in an effective way. Do not criticize them, even when they fail to handle everything at the beginning. Children easily discourage when they do not feel the support of their parents, so do not forget to demonstrate them that you are contentwith the final results from their work. Being a good example to your kids always pays off. When cleaning is concerned, the rules are pretty much the same. Kids will immediately observe if you do not participate in the process of cleaning. On the other hand, when you are a good example and provide the cleaning tasks on a regular basis, this will constantly remind the kids that it is essential to focus on these activities. Distribute the chores among all the family members and explain your children that everyone should manage with the task during the week. This way they will quickly get used to the idea that cleaning of the rooms need to be provided on a regular basis. 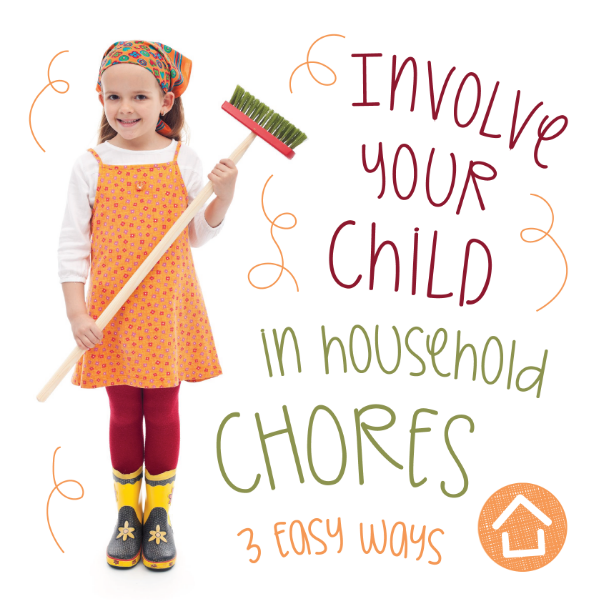 These are 3 great ways in which to involve your kid in the household chores in the fastest possible way. Stay patient and supportive because this is not an easy task but once you learn how to collaborate correctly with the kids, this problem won’t bother you anymore. Keep in mind these tiny tips, whenever you feel unable to explain to the kids that they should take part in the household chores more often. Prove the children that cleaning could turn into a fun experience and appreciate the dedication of the kids. It is true that adults are also reluctant to provide cleaning but as long as you are motivated enough, you can create the best family cleaning team. This guest post has been contributed by Patricia Cornwell of Clean Start Carpet Services.